I was at the local swap meet/flea market today and picked up a couple of nice pieces. One is a signed glass goblet, nice flame polished grind work with some matt details. I paid a dollar for that one, but the real buy was for 50 cents, I paid full price for both pieces, unusual for me. 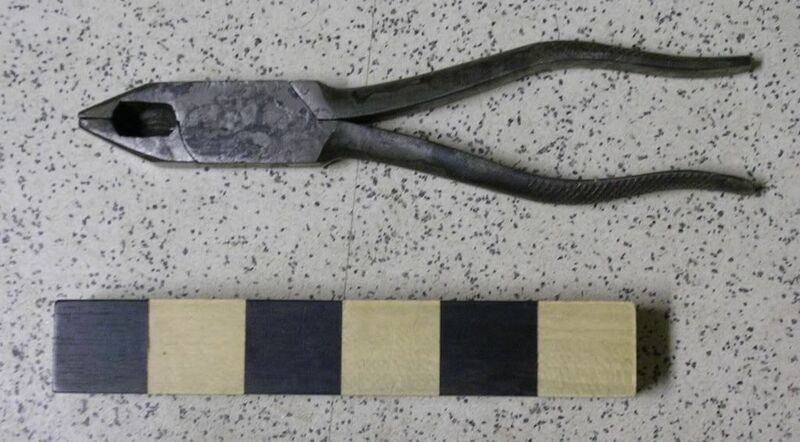 Here is the backside, the cutter section is forged welded steel on the iron pliers. 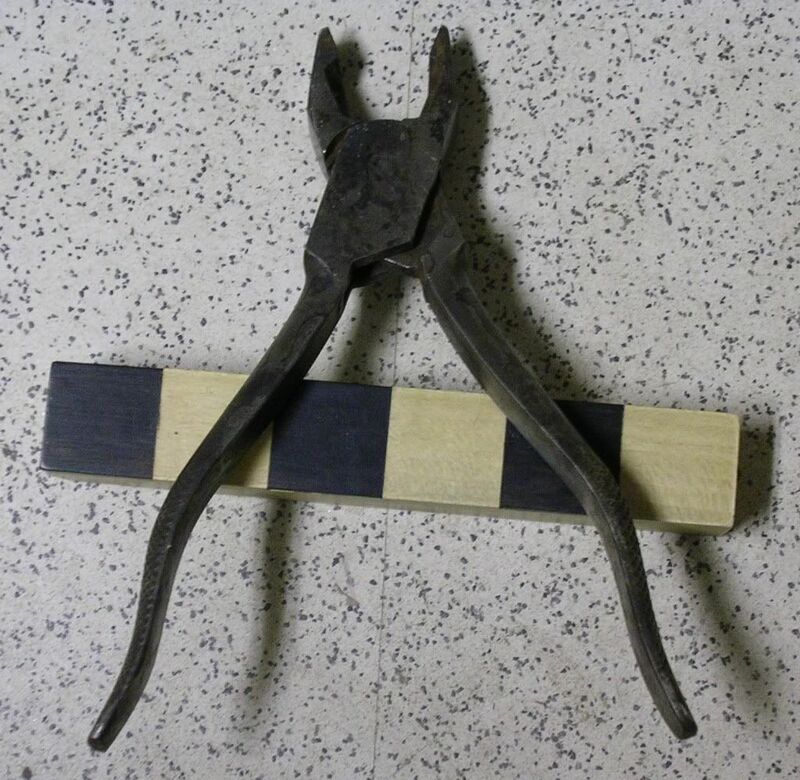 And what is most unusual about this pair of pliers is that they are box jointed. I had replaced my side joint needle nose pliers with earlier box joint versions as well as several box joint flat pliers, but I only had side joint wire cutters. I was not certain that I would ever find a pair of box joint wire cutters, I wasn’t certain they were even made. Well much to my joy and excitement I found these. Covered in nasty heavy grease, there is some surface oxidation, but they are in excellent condition after minor surface cleaning. There are no makers marks of any kind. I am easily amused. I got the new door joined together last weekend and finished the sash work. I have posted earlier on making the sash molding with a rabbet plane, lacking a proper sash plane. But I did manage to shoot and stick enough molding to do the entire door with a bit left over, better than running short. When I first looked at the existing door that I am copying, I thought that there was a mortise and tenon joint at every intersection of cross pieces. Well, thinking does get me in trouble from time to time and this was the case. Upon careful examination, by just taking a closer look, was that they were indeed mortise and tenon joints but they were very small and the mortise was simply chopped into the sash molding down to the rabbit on the back side. Then the ends of the mullions were coped to fit the angle of the sash molding. That little birds mouth held the pieces in place. Now the uprights look straight and they are fairly straight and to keep them that way exact measurements for the cross pieces was critical. But one thing I did learn, which made things go a lot quicker than I anticipated was that I could take the measurements for the cross pieces from the back side. The cross pieces were exactly fit in between the rabbets, so I could use that space to accurately mark the cross pieces. Then there was the task of coping them to each piece. Because they are hand made there was some variation, but after chopping 38 mortise and tenons for just the mullions and four more for the door frame, that was a lot of work. I did carefully scribe the first several that I did, then being lazy, I just eyeballed them and got them close enough that a final work with a sharp chisel brought them into proper fit. 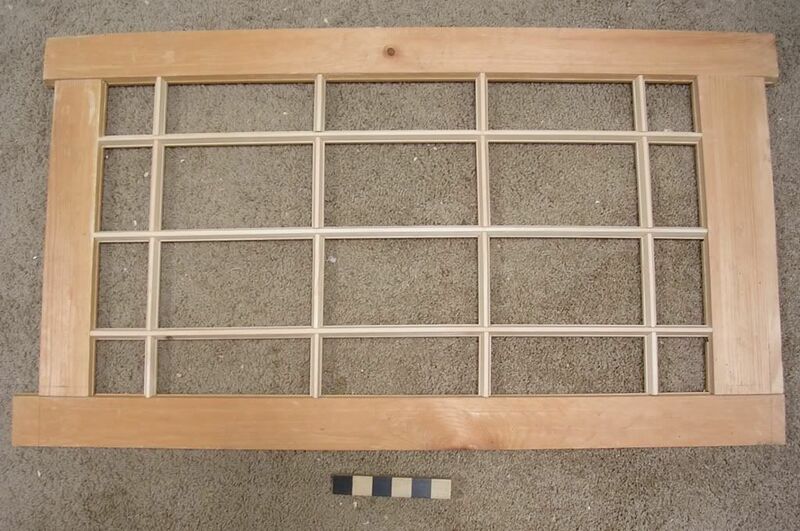 The last photograph shows the door completely assembled but not glued up. I had to tweak things and actually replace two cross pieces as I was straightening the uprights. There is some distortion of the picture and the door looks bowed but it is not. Glue up should be a lot of fun. I also started cutting the glass for both doors. The original door had all of its glass broken out by young boys throwing rocks to break them. The small openings were a difficult target and the rock damage to the mullions and frame was substantial and took about 20 hours to just do the small Dutchmen repairs. This is by far the most challenging restoration I have ever encountered. It is also an historically significant piece, known owner and maker, and one of the earliest Utah pieces that I have ever worked on, this one was made in 1852. Unfortunately I don’t think I have a photograph of the piece in the condition in which I received it, but it had been painted black over the original walnut graining over pine. It had sat in a barn in Southern Utah and had some issues like animal crap and mud-dauber wasp nests, plus the years of grime. This secretary is a real study piece in early construction, adapting to the rigors of the isolated West and shows many of the tool marks from the original construction. I will be posting more on this piece with descriptions of its construction. Tools. Lets see what kind of dander this fluffs. The recent post on English Influence, there was a considerable amount of interest and comment, so I would like to explore this issue further. The origins of British design are still in contention, but many tools remain largely unchanged since Medieval times. And no doubt tool production reached its zenith and great abundance in the United Kingdom. Although I am not sure when they became united. However what was produced here in America often falls short of the standards and quality of British tools, and we are talking hand woodworking tools. Machine tools are another subject. The English (I will use that term hoping not to insult anyone from Scotland, Ireland, Canada, &c.), tools are just nicer looking than their American counterparts. America is a melting pot of people from all corners of the world. I wonder if the corners of the world are from when we thought it was flat? There were more German emigrants than any other country, yet there influence certainly did not have the impression on American tool making ad did those from Britain. Yet American tools don’t have the sophistication and refinement as those from England, but there were reasons that American versions aren’t that refined. The main reason is that ‘improved’ manufacturing techniques did not lend themselves to producing anything too complicated. With the pressure of supply and demand created by the industrial revolution (which came about due to the introduction of the potato into Europe from the New World), it was necessary to make more utilitarian tools, and it was not until later in the nineteenth century that the Victorian influence (wasn’t she an English Queen?) that hand tools took on some embellishments. Some were quite gaudy and garish. I bring up Dutch hand planes as they are some of the most fancy embellished planes that I have ever seen. Now those fancy late nineteenth ivory plows are bodacious, the fancy Dutch planes appear to be actual user planes. Those decorative scallops do provide a better grip on these planes, and Russian wooden hand planes were toothed on the outside to improve grip. Look at saw handles on British hand saws and closely compare them to those made in America. Both design and execution are noticeably better on the English versions. The normal bench planes made in Britain have much sharper edges and more defined characteristics than those of American origin. Now does this matter in the overall picture, probably not. 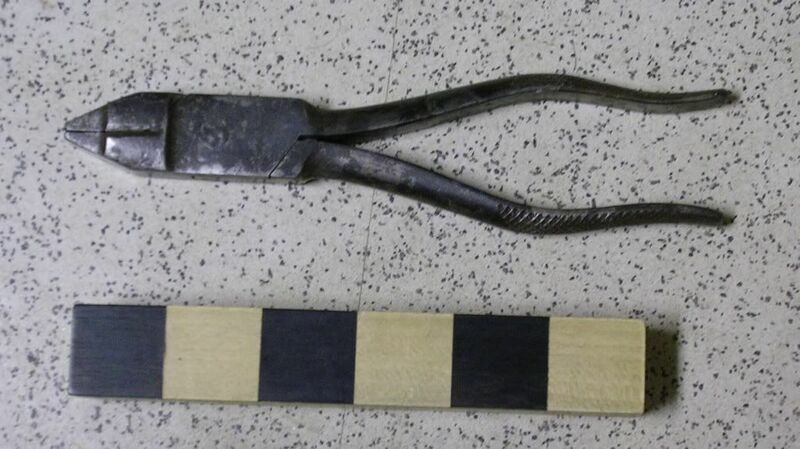 It is arguable that Sheffield steel is superior but many American makers used those iron/steel tools. That aside there probably isn’t much difference, but the ability to supply the demand still saw imports from England, Germany, Spain and other countries to meet the growing American demands. And marketing may well have had much more influence on tool design than we may expect. I believe the introduction of the backed saws with thin blades in the early 19th century was a marketing ploy. A ‘finer saw kerf, wastes less wood’ was the hot buzz word/phrase from that time period. Like anyone here in America cared about saving wood. Here is what a back saw is: it is a tool that requires less steel, because it is thinner, the cheap wrought iron or brass back stiffens the saw blade that is just too thin. So it should be cheaper but it wasn’t. Like the ‘solid cast steel’ tools were more costly than laid steel tools is marketing as they are actually cheaper to make but sold for more money. That is good business if you are selling tools. But not necessarily a good thing, at least for the craftsmen that had to use these tools, the old farts continued using what they had and disparaged the new improvements preferring the traditions that had learned early on. Then they all died and no one cared and everyone wanted the ‘new and improved’. We were the upstart colonists, we had our own agenda and were interested in creating our own standards and traditions. We were our own new country and had needs that needed to be fulfilled. So we dropped some of those embellishments and even forgot what certain features were actually created to produce, such as the nicker nib on hand saws. Henry Disston was at a loss as to its purpose. Is it hubris or is it that we needed to create our own identity in the international community that we reduced tools to a common denominator of utility? We produced quality tools that just weren’t as good looking as those made in other parts of the world. The guilds, societies and associations that had greatly influenced the trades early on began having less and less significance in America. There were more people in Europe than America in the late 18th and early 19th century, so labor was cheap and materials, namely wood was not as readily available, especially in England and had to be imported. In America there was plenty of wood, of course ebony, mahogany and rosewood and other materials like ivory were necessarily imported on both sides of the ocean. In America labor was scarce but the world was expanding, demand was great and with improvements in clean water supply and advancements in medicines allowed people to live longer. I am not sure I have given the reasons that American hand tools aren’t as good looking as English and European tools But there are noticeable aesthetic differences that have come to the attention of others as well. For the past 36 years I have devoted my career to the study and application of Traditional American Woodworking. I have focused on the technology of the early nineteenth century, the tools, materials and techniques of the woodworking trades. I chose that time period because I thought that it had been largely overlooked. Because of my location I focused on the state of the trade in the West. I gained some experience in the Mid-west and was familiar with the information available about Eastern woodworking, and chose pioneer and rural settlement influence rather than the metropolitan urban trends. I have recently come to the conclusion that better than 50% of what I was looking at was a direct product of England. Yes, the Mother Country, the one that lost two wars to us, from whence many of us emigrated. Here in Utah in the 1850’s about 54% of the population was from Britain and brought traditions and tools with them. The number of tools that I have from England is about 40%, 10% from elsewhere and half American in origin, with many of those from England. I am not playing down the significance of other emigrants and we are all emigrants except the autochthonous people. Sheffield Steel and tools made from it are among the finest in the world. Also the most prolific in production, the shear quantities drove down prices world wide. Old World practices such as guilds, associations, societies, apprentices, etc were copied on this continent with adjustments to more resources and less labor. The direct opposite of European supply/population ratio. We were reliant on imports, we couldn’t make everything we needed. We even attempted to use the same language. With established trade and a couple of disputes out of the way, England was the best game in town. Influences like Moxon, Hogarth, Chippendale, Sheraton, Hepplewhite, Nicholson, et al from publications and guides and printed tool and hardware catalogues of the period were felt on this side of the ocean, can not be denied. Repressed during Colonial rule to repair work only, little was produced until free from those constraints. The end of the 18th and beginning of the 19th century saw a burgeoning industry of tool manufacturing in America. But if you look at those tools, many are patterned after English examples. But American production could not keep up with American demand and imports were necessary. Perhaps the situation here in Utah and the West is unique. Our pioneer and settlement period took place much later in North American History Settlement on the East coast began in the early 1600’s and that didn’t occur out here until 1847. California and Oregon were occupied with some settlement a bit earlier. Prior to that the Hudson Bay Fur Company and other British enterprises were exploiting the rich fur trade of North America to satisfy European fashion demands. David Douglas a botanist for the Royal Botanical Gardens at Kew, spent years in the Pacific Northwest and the Douglas fir is named after him. The Spanish and French also claimed land in North America, which were later purchased or taken. During the mid nineteenth century an enormous amount of money was spent on a Trans Atlantic Telegraph Cable from America to England. The first in 1857 failed, the one later in 1866 after the American Civil War worked. We were able to call home. The introduction of steam technology, developed in England was employed in the woodworking trades and adapted to sailing ships. This reduced the crossing time from 4 to5 weeks under sail, under steam the time was cut in half. Steam power to mills and shops replaced water power which was seasonal and froze in the winter time. Another unusual and perhaps singular distinction in Utah emigrants is that most of them had come directly to Utah Territory directly from their country of origin. Many of course were from the States, but the majority had only a brief passing through America and brought their customs, traditions, knowledge and tools with them. It is possible to determine the cultural origins of a piece of local furniture by its construction, especially dovetails. Danish, German and English styles are reflected in what they made. Am I an Anglophile, well William Shepherd, my great great, great, great grandfather arrived on this continent from England in 1755, so maybe I am. And Moses Trader Shepherd, my great great grandfather was out here in the early 1850’s. Funny thing is, I own two reproduction American flags, the 13 star flag that flew during the American Revolution and the 15 star, 15 stripe flag that flew during the War of 1812. We even used the Pound and Shilling as currency and British Gold and Silver was legal tender in America until 1857. And the English Foot is 12 inches long. I once had pickled English Walnuts, hulls, shell and meat, they were quite tasty but have not ever seen them again. And then there is English Marmalade (with bitter Seville oranges) on a toasted English Muffin, well, what can I say. And while we have had our differences over the centuries, we have been reliant on each other in an economic relationship that has benefited both countries. And I would like to give credit for much of the woodworking done in America to its origins, influences and assistance from England. So, smell the Roses, have a little ‘bubble and squeak’, raise a glass of single malt and God Save the Queen. A discussion over at Wood Central Hand Tool Forum talked about woodworking and what was more important the Journey or the Destination. Or the process verses the product and which provided the most rewards. That got me thinking and you know where that leads. Some argued that it was the journey that provided the most enjoyment, using their tools with their skills to do the work and to learn from mistakes and from others. Then there were those (fewer in number, no surprise) that thought that it was the destination was of more importance. Whereas the journey was only incidental in getting the finished product. It wasn’t the tools it was what the tools made that was the reward. This dichotomy has been around for a while, I am not sure why we need dichotomies other than a single chotomy is rather boring. We as a species do like to organize things and put them in categories and have labels and like things neat and tidy, well some of our species. I thought about both sides and both arguments, I considered the journey as well as the destination, the process and the product. I initially thought that I was a more process oriented craftsman and that the product was secondary, yet important because that is where money is made. People that do woodworking as a hobby generally (and I dislike generalizations) are more process oriented where making the project is more fulfilling than the project itself, although it has some significance. People that do woodworking as a profession are more concerned about the end product as that pays the bills. Here is my take on this issue. (I do woodworking for a living and it is also my hobby, I don’t have a life). I can not make the distinction between the journey and the destination. When I am in the process of building something (the journey), I can not fail to consider the outcome (the destination). I actually start at the destination , what I am going to be building and the idea of the final product is in my mind, sketched on a piece of paper or from a photograph or other source. So I begin my journey at the destination and at that point consider how I am going to build what is in the queue. I plan my journey only after I have a good understanding of where I intend to end up. In my case the journey and destination are not separate. Even if the terminology is different I can not consider the end result, the product without understanding the process. Although I have designed things that in the end were difficult to build, I try not to do that anymore. I do a fair amount of repair and restoration work and in that case the product (destination if you will) is already there and it is just the process or journey. I also make reproduction furniture and tools and existing examples are around to copy. So by examining them closely I am able to discern many of the techniques incorporated in making the piece as well as discovering what tools were used in the process. The latter by the marks they leave. For me the process is inextricable from the product, they are not the same thing and I can’t consider one without considering the other. And then some will just say that I do things backwards. I make my own, well, rulers that is. I will get to that in a minute, what got me thinking about this was a post over at Logan Cabinet Shoppe about over-rated thin shavings. An excellent discussion about focusing on something that is of little importance, namely the shaving. People treat these thin gossamer shavings as something wonderful, while I view them as something I am going to have to sweep up later. The only shavings I am interested in come out of my spile plane, they are thick, have a nice curl and I can actually sell them. Handy for starting a fire, but more often sold as a home decoration. These shavings are important and I save and sell them. I could check my shavings with a wire gauge (the only tool I have that can measure that small), but why would I really care if my shavings are .0001, I don’t think that matters, what matters is how the wood looks that I have just removed that shaving from. 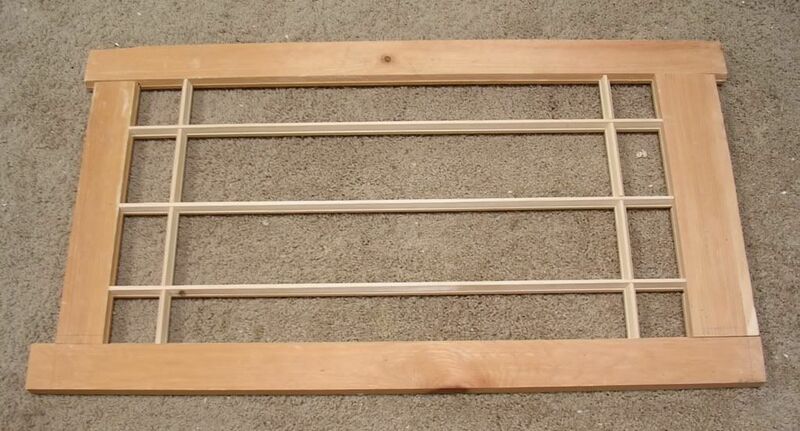 Now to my point, I make my own tools including layout tools and rulers. Here are a couple of rulers I have made along with the tool I use to make them. The top item is the stamp used to make rulers. The center ruler is a standard 12 inch ruler, the lower ruler is a centering ruler, marked out from the center. I didn’t think I needed to include the gnomon. It is inspired by an original I had seen from an old box of tools belonging to a friend of mine and made this ‘copy’ of the original about 25 years ago. It is made of a piece of mild steel 1/4″ thick and 1″ wide and 6 inches long. I start by carefully marking 8 equal spaces (1/8″) along one edge with a sharp file. This is a starting place for the hacksaw to make the cuts down just under an eight inch. I then use a triangular file to carefully sharpen the marking teeth. I didn’t quite get everything just right the first time and found I could move the arrant tooth with a cold chisel, so after a bit of fettling I got the marks in the correct location. I kept checking with a metal ruler to make sure it is the correct length. I then filed off some of the teeth to delineate the 1/2, the 1/4’s and the eights, the last being the shortest. This gives a visual as to where the individual marks are, the ends are the longest, then the halves, then the quarters then the eights. One thing I did learn about this stamp is that you can’t just start stamping and moving the stamp to the next location as it will end up too short. This is caused by the taper on the outside teeth and they tend to pull the stamp too close resulting in a ruler that is too short. To compensate for this I mark out each inch on the ruler blank and mark it with a cold chisel (sharpened) on the inch marks. This gives a positive register mark to align the stamp for the next inch. And why do I have rulers marked in 1/8″ increments only? Well I know that 1/16″ is right in the middle of the eighth mark and anything less than that I just don’t care about. I make furniture by hand and measurements in the hundredths or thousandths are meaningless. I make tools and those fine measurements are equally meaningless. Very fine measurements are only good the moment you make them as wood is hygroscopic and will take in and give of moisture regularly, so tiny increments are irrelative. After all he invented the pendulum, plate tectonics and wave theory, in the 17th century. It mostly has to do with frequency and that is determine3d by the length of the pendulum and to some degree its mass. More importantly where that mass is located. The usual location for the weight is in the bob, near the swinging end of the pendulum shaft. Now why would I bring this up? Well it all has to do with the wall clock I made. Remember the one I have to move the mechanism and dial down. I had put the mechanism on the back board a while back in order to offer some protection to the works before I built the clock case. While on the board, I could not slow it down enough to keep proper time, it ran too fast. The wire extension did the trick, but upon ‘completion’, the works needed to be dropped, the extension removed and the bob adjusted all the way down. Still running a bit fast I was in a quandary. So I called the Professor (of Mathematics and Physics) and posed the question of how to slow down the pendulum? Could I add weight to the bob? He paused, mentioned an oncoming malady effecting his head and grabbed a math book to check his thoughts. Then a physics book, then an interesting solution. He suggested an increase in the gravitational forces directly under the clock would do the trick and could be accomplished with a small amount of a neutron star material. I asked him to send me some, he said yes but that I would have to pay the postage. Well, we thought it was funny. Adding mass to the bob will only slightly decrease the swing. What is important is the location of the weight. He said by reducing the weight of the SHAFT of the pendulum would slow it down. That to me was counter-intuitive, then I thought about John and James Harrisons work with heat compensating pendulums in the early 18th century. John Harrison eventually was rewarded for his resolution of the problem of determining longitude at sea by developing the first chronometer (actually two movements that correct each other). Because part of the shaft is wood, I can remove some of its mass by gouging wood from the back side and I think I will add some lead shot to the bob, it is hollow on this movement. I actually have about 5/8″ below the bottom of the pendulum and could add a smaller extension, but I like the placement of the bob where it is, so I am willing to play with the physics and math. I should have paid more attention in school. 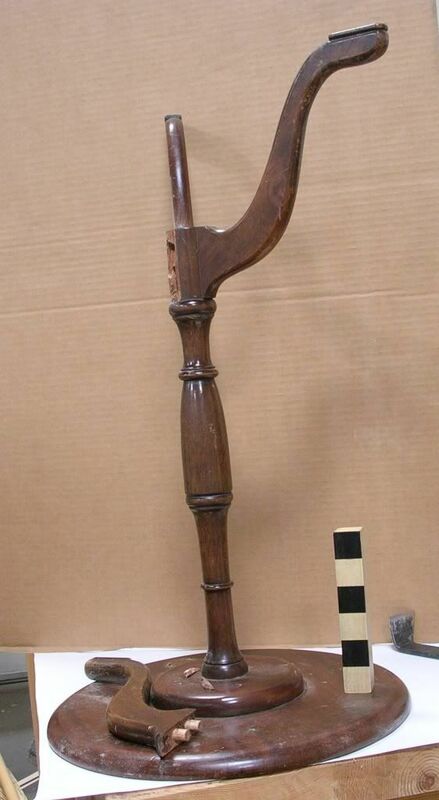 This is an interesting reproduction tripod table. R.G. 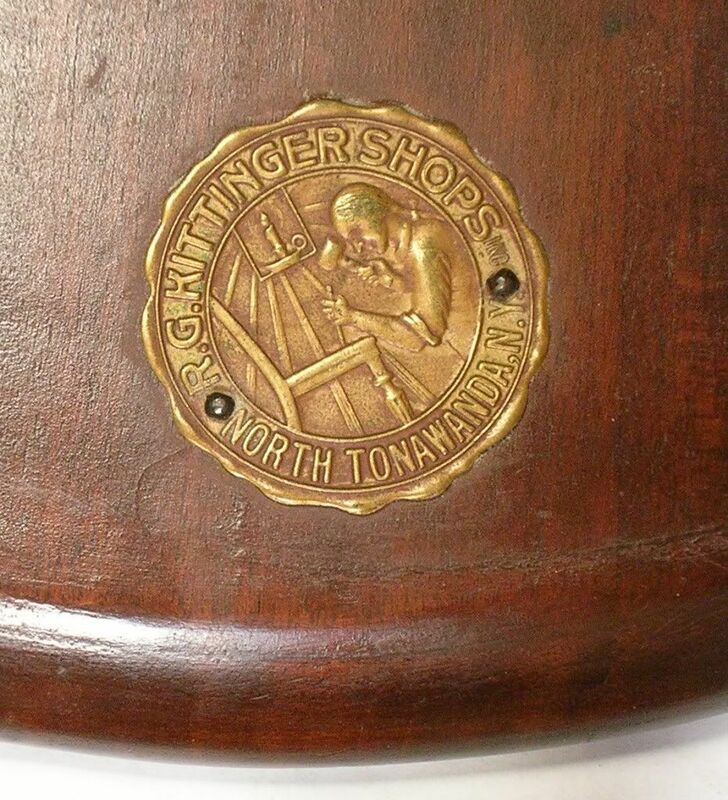 KITTINGER SHOPS – NORTH TONAWANDA, N.Y. It was probably made in the early 20th century, there are slotted screws on the piece holding the top. They actually saved the two pieces that broke out between the two dowels. The couple that owns this table also owns the Child’s Rocking Chair, mentioned earlier. Made of mahogany and glued together with HIDE GLUE. The repairs were easy, cleaned the surfaces of dust, coated everything with liquid hide glue and put it back together. When doing repairs it is important to do them as soon after the damage as possible, so the breaks are sharp and fit back together well. I clamped a small wooden C-clamp across the leg to give a purchase for the other two clamps, a wooden cam clamp and a small iron adjustable clamp. All surfaces needing protection had a piece of soft wood to prevent marring during clamping. With everything snugged up, I used a wet rag to remove the glue that squeezed out. I will give it a coat of Moses T’s Reviver and it will be ‘good as old’. 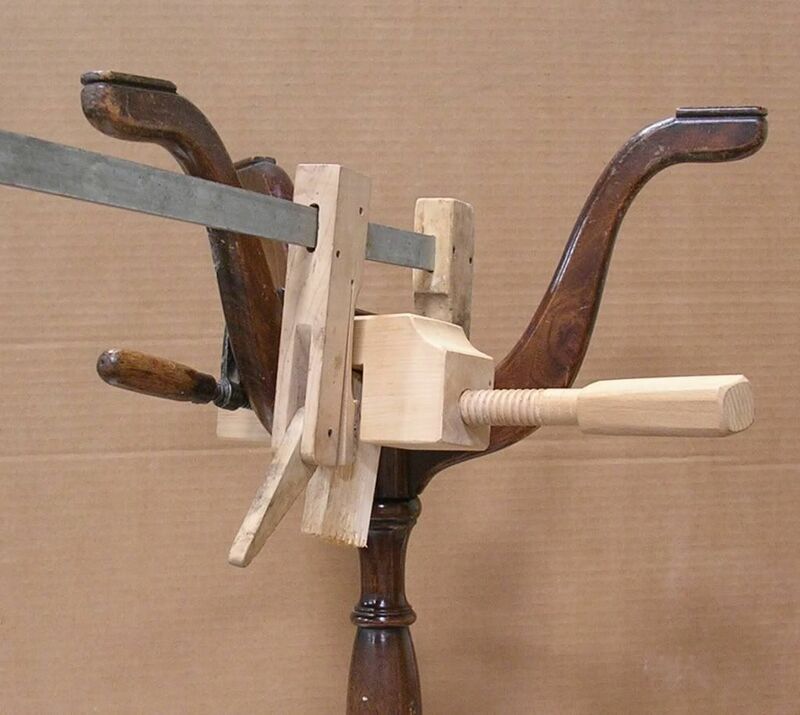 If I were going to make a tripod table, I would either make a jig that fit the leg like the above C-clamp to give a purchase or have a notch in the leg (in extra wood, cut off later) to allow a good seat for the clamps. But then if I were going to make a tripod table I would use sliding dovetails instead of dowels and there is no need for this type of clamping. Well as promised here is a picture of the tools I use. I do not have a set of steel graining combs at this moment, I need to order another set. 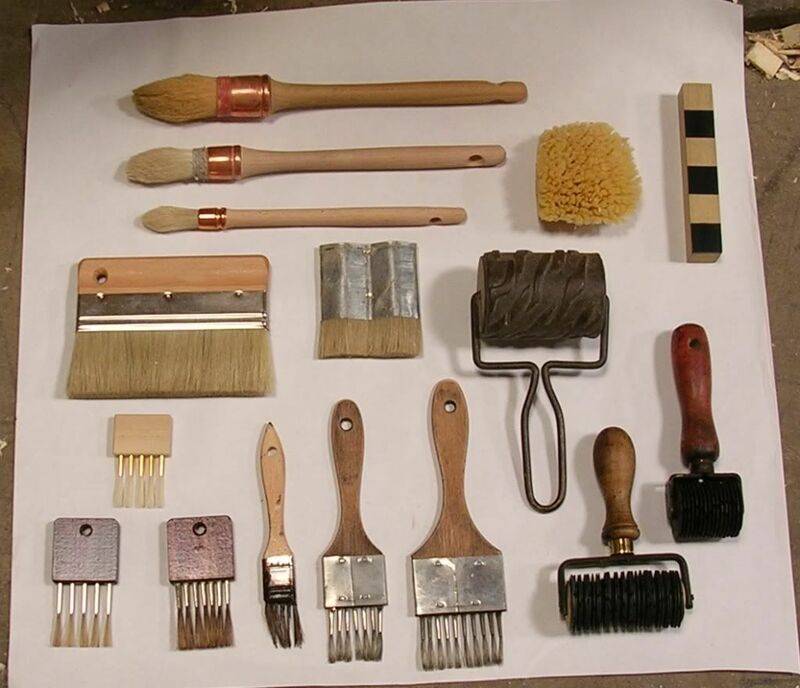 The round brushes at the top are the type used in the nineteenth century, oval and flat brushes are later. The only flat brushes in the nineteenth century were for graining. The larger round brushes have bridles on them to hold the bristles tight. As the brushes wear, the bridle can be removed for additional life. The Elephant Ear sponge is used for burls, I also grain canvas to look like leather and the sponge work for that as well. You will notice that I don’t have a feather in my tool arsenal. People would ask me about that all the time as sometimes the painting and graining is referred to as ‘feather graining’, and there is some association with feathers being used for marbleizing, but I have not seen any old grained pieces that were done with a feather. The large flat brush it a mottler that is used dry to manipulate the graining to blur or mottle the grain. Can also be used for the subtle cross graining of interlocking wood like ribbon mahogany. I also have a wavy mottler that is used for the same purpose. Its advantage is that it doesn’t leave a straight mark like the flat mottler can. The roller with the wire handle is used to add flame grain to oak graining. 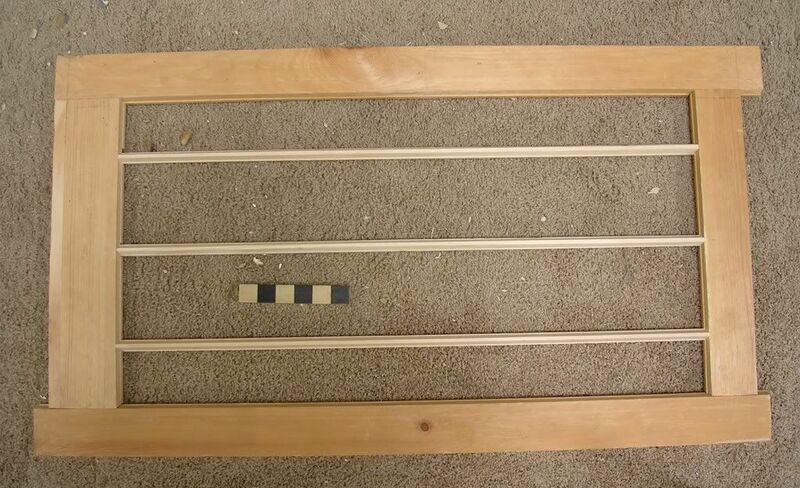 This simulates the medullary rays of quarter sawn white oak. Oak graining is done with a slower drying glazing medium made from thinned down spar varnish. I prefer McCloskey Marine Spar Varnish in Gloss. I buy the gloss because it does not skin over as fast as the semi-gloss or matt versions. I can also make it semi-gloss or matt by adding whiting (calcium carbonate). This is a subtractive process. The varnish is thinned with a bit of boiled linseed oil and turpentine to which I add burnt umber dry powdered pigment. It is applied to the surface with a brush or rag, the surface just needs to be covered with a thin coat of the graining medium. I then will dip deeper into the jar and get some more pigment on the brush or rag and make a few streaks of darker color. I might also wipe a bit off of certain areas to imitate natural changes in the wood. The brushes on the lower left are all pencil-over-grainers. The one in the center is a shop made version taking a cheap bristle brush and removing a lot of the bristles. They are called pencil over-grainers because in the nineteenth century small round paint brushes were called pencils. I can use these to apply graining (additive) or I can use them to manipulate the graining medium (subtractive). I also hold these at a skew. By skewing the combs or brushes, you can vary the spacing of the lines. Combs are worked over the entire surface from one end to the other with the comb in contact the entire time. The over-grainers are not used in that way but only periodically touch the surface, so there are no solid lines on the surface. The rollers on the right hand corner are called ‘Checkering Rollers’ and are a series of serrated wheels with spacers and are used in an additive process for putting on very fine grain lines. They are used in conjunction with a brush that charges the wheels with graining medium and transfer long dashes along the surface. The one on the far right is a new model, they are available in a couple of sizes. The larger checker roller is an antique from England and has a much looser axle, so it will go over moldings, this is a sweet tool, I had to pay a lot for this one, cost me $85.00. There are other tools out there, Badger brushes, floggers, etc. I have seen people use floggers but haven’t bought one for some reason, I probably should have one as they are a neat looking brush. They are used to manipulate the grain, they have long loose hairs or bristles that flop around as you flog the surface. Bob at Logan Cabinet Shoppe suggested that I do a blog post on painting and graining. Good idea, so here is a description of the process of painting and graining. It is also called faux bois (French for False Wood) and marbleizing (to imitate stone) and another process called scagliola (an Italian term for something), which is actual ground up stone in the work. It actually takes me longer to properly prepare and paint a piece than it does to do the actual graining, which goes quite fast. The surface should be smooth and the paint applied in the direction of the ‘intended’ grain. So for cross banding you would apply the paint in that direction. This will add to the overall look of the piece. It starts the process by adding a slight texture to the surface, it is more of an optical thing rather than a visual one. I use only oil based paints (no latex) on my pieces as I want them to last. I also use an alcohol based paint, the advantage of this is that it dries in minutes. It is just shellac, alcohol and dry powdered pigments. In the nineteenth century paint was sold by the pound, indicating that it wasn’t liquid. Dry powdered pigments can be purchased at any ceramic/pottery supply house and are finely ground. Do be careful as some of the pigments can be dangerous, red lead, chrome yellow, etc. The base coat is always the lightest color of the finished graining. Now this base coat can be quite bright, I have grained mahogany using a bright orange base coat and it turned out very nice. The bright or lighter base coat reflects through the over graining and adds ‘artificial depth’ to the work, making it more convincing. Speaking of convincing, here is when the 6 foot rule applies. If I were to paint an exact copy of a wood like walnut or mahogany, it would only look good from a foot or two, beyond that it looses definition. What you need to do and what is of the utmost importance is to make the wood a cartoon or caricature, rather than an exact copy. The grain is exaggerated, so that when viewed from a distance, the first thought is that it is real wood and they never give it a second thought. I painted and grained an example of walnut that was convincing at 2 feet, but from a distance it just looked brown, not at all like wood. Years ago, I had a painted and grained Gondola chair in the window of my shop, it had a mahogany crotch painted on the seat. A fellow stopped by and said that in his 40 years of woodworking he had never seen a piece of crotch mahogany like that one. I turned the chair over and told him he still hadn’t. He was surprised. There are two types of graining that can be done after the piece is painted. There is the additive process and the subtractive process. The first adds the graining to the painted substrate with brushes and rollers, this is how I do most of my graining. The second removes or subtracts the graining medium from the painted ground work, this is used mainly in graining oak. For the first process I can use the alcohol base paint to make the graining medium. For the second process I use spar varnish, thinned with oil and turpentine with a pigment (burnt umber for most, black iron oxide for rosewood). The tools required are few and most can be easily made in the shop. I do have some specialized tools made just for graining and they are commercially available. As for the pigments, I have a limited pallet that works for everything I have ever had to grain. Black Iron Oxide, Red Iron Oxide (in lieu of red lead), Yellow Ocher, Burnt Umber and Zinc Oxide (instead of white lead), are the main pigments. I also have a small bottle of Prussian Blue that I can use for blue or green, which I seldom have to make. I will take some pictures of my graining tools and post them in my next post.